Search engines Google, Bing and Yahoo, step aside, because Apple’s changing things up. 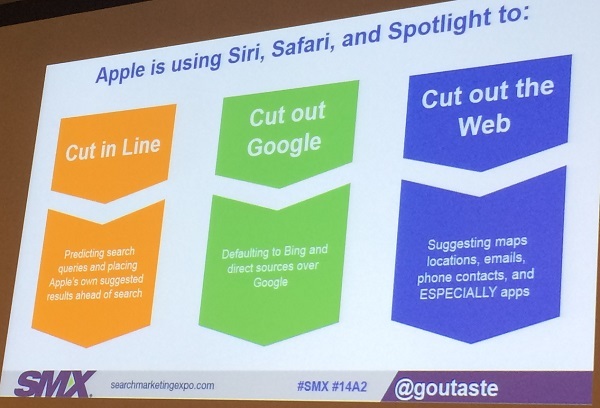 This insightful SMX East session “How Apple’s Changing Up Search: From Siri to Safari to Spotlight” discusses the many ways Apple products are impacting search and what marketers should know and do about it. 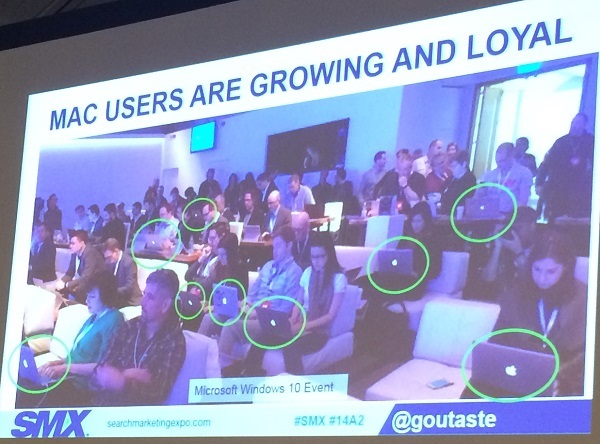 Most people at SMX will talk about Google, Bing and Yahoo. But today’s session is about Apple. Apple is growing in terms of hardware. TechCrunch reported 3,000 iPhone sales a minute. The devices Apple sells are across the board, from laptops to TV devices. In 2013, CEO Tim Cook said Apple is not a hardware company and that there are many other things that they want to do to grow revenue. Apple has owned these markets: App Store and Apple Music. These markets are threatened by YouTube, Google Maps, Google Play and Google Search. Google Search gives information for free in an independent market place. In some ways, search has become the ultimate threat to Apple. Spotlight: Allows you to search content on your device, web content, and other content as Apple introduces it. 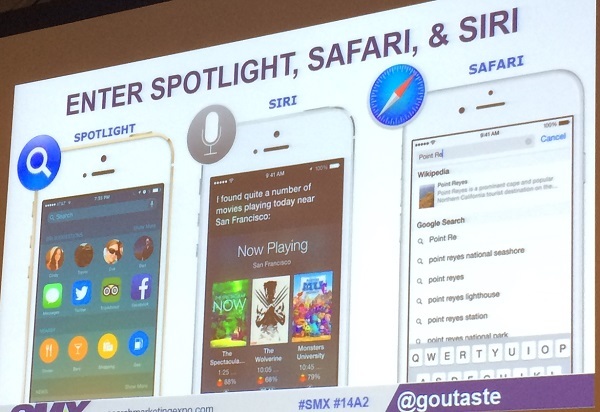 Siri: Similar to Spotlight, but searches are done through voice command. Safari: This mobile browser has been pulling in suggested results from Apple for a while now (i.e., Apple-suggested search results in Safari). Apple wants us to think of these three tools collectively as Search. The Safari browser has 53 percent of the mobile market share because iPhone users are unlikely to change their default browser. Apple is using its three tools to cut in line, cut out Google, and cut out the web. Ride the Apple Bypass into Traffic (or Engagement) Land! 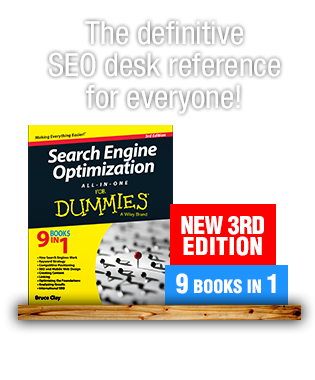 Grossman gives this caveat: Don’t take this as no more Google or no more SEO. We’re not in a situation where Apple has a worldwide market share for search. 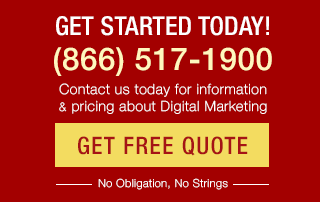 Don’t abandon your Google SEO. Predictive Search — Apple has a less sophisticated version than Google Now does of predictive search. But Apple is predicting queries and suggesting results before the user even executes the search. Spotlight and Siri default to Bing search over Google search for suggesting search queries. Siri and Spotlight use Bing, and Twitter is even offered as an alternative search source before Google. Safari still defaults to Google but provides alternative options. Apple is doing this by suggesting map locations, emails, phone contacts, and especially apps. We think of search engines as organizers of web content. Apple is trying to suggest as much information as they can outside of the web. Siri suggests contacts, apps, and Apple Maps first (in iOS9). Set up a business with Apple Maps. Make your Apple Maps listings as attractive as possible. She thinks the most interesting thing is that Apple publishes information on where they get their local information from. A major way for your business to cut in line is to get a customer to download your V Card. Email Optimization: This is happening now! Put the most important keywords in the subject line. Putting them earlier in the subject line is better. Apple prefers recent emails to older emails. Mobile devices can pull only what is stored on the device (less than on a computer). 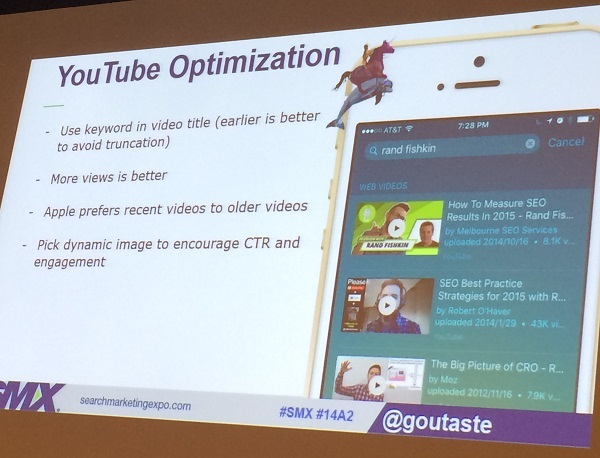 Grossman moves to the topic of YouTube optimization, because YouTube videos are dominating in Apple Search. Apple Search also suggests iTunes content. 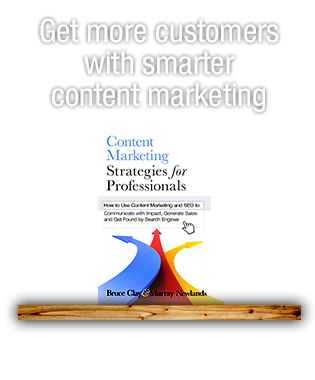 Publishers and content marketers take note! Publish content to iTunes. Apple’s App Store commission is now at a run-rate of $9 billion! 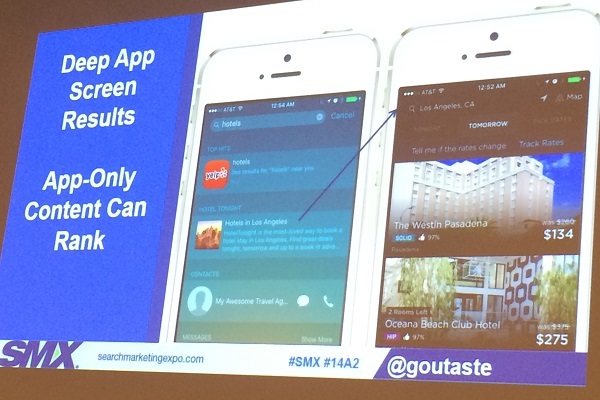 This explains why Apple is looking here to pull up suggested apps in search results. Deep App Screen Results: The newest thing in search app indexing in the new iOS 9. 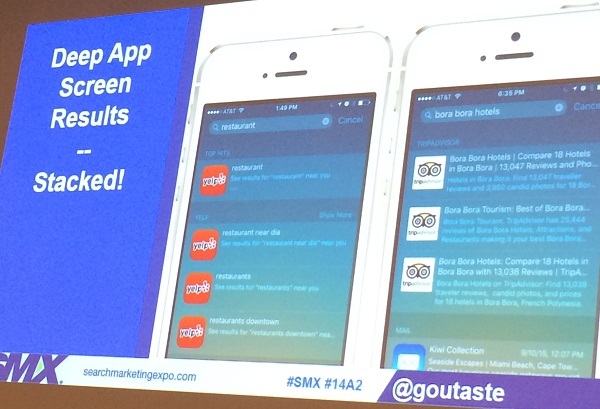 You can jump from a search result to a specific page in an app. 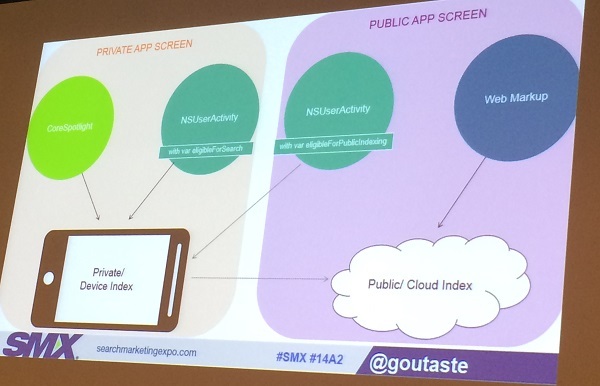 Indexed app screens can be public or private (user-specific). In a messaging app where all content is private, users see only their messages. Apple Search sources from two indexes: Device Index (private) and Cloud Index (public). Used for indexing app screens that contain private/personal data. Does NOT require corresponding web content. This is a private Device Index. Used for indexing private and public navigation points in the app. This can be a private Device Index and/or public Cloud Index. Used for indexing public app screens that mirror content on the web. DOES require corresponding web content. This is a public Cloud Index. When it comes to getting your app to rank in Apple Search, there are some known ranking factors that can either help or hurt your chances. So pay attention to engagement, installs, click-through, and structured data on your website to help your app show up in Apple Search. Apple doesn’t want interstitials in your app — they don’t rank deep app screens as high if they have interstitials. In the future, you may be able to use Apple TV Search with Siri for tvOS and speak the query, “Show that Modern Family episode with Edward Norton” — and then see it. Who’s It Going To Be: Apple or Google? Closed garden or open garden. Google is pushing HTML5 apps and it’s an experience that feels like an app. Grossman feels this is the path of least resistance. The API/feed option is going to be the future, rather than apps. Apps will go up and then go down. The most popular app where you’re spending twice as much time is the browser. The browser is very powerful. However, she still recommends that, in the short-term, you should have an app so you can take advantage of opportunities that are uniquely available there.